Since I got the OK from my doctor, I've been commuting on my bicycle. That is, in the morning, I ride the bus in and I ride my bike home. There's no way I could ride the bike in, because I'd get too competitive. I'd arrive at work with sweat pouring off me (even though the commute is roughly three miles straight line), and I have no shower facilities at work. I think my co-workers* probably appreciate my not working up a sweat on the way in. I think I'll be commuting with the bike as long as I can – that is, I'll probably stop when the snow forces me to, but as long as I have traction, I will be riding home. Occasionally, I get irritated with the drivers while I'm riding – for instance, when I was riding along the right-hand edge of the road, as close to the curb as I could, at about 15 mph, when a car, traveling in the same direction as me, turned in front of me. As if that wasn't bad enough, the driver came to a complete stop partway through the turn, blocking me from going through the intersection, and looked straight out the window at me with a somewhat stunned look on her face. I had to come to a complete stop, because of the other cars in the road (actually a bridge). So, I'm almost going over my handlebars, and this driver is staring out the window of her car at me. And don't get me started about the guy texting and starting to roll forward through the intersection. I had to scream at him to stop, and he's lucky I did, because he'd have been T-boned if he'd kept rolling forward. On the other hand, I see some pretty unusual stuff from my bike. The other day, I was stopped at an intersection, and next to me, a young woman rides up on a red Vespa, wearing a red helmet, red and white dress, and red high heels. My first thought was that I'd been transported to a movie about post-World War II Italy. After that, I thought "I've got to start bringing a camera with me." Here's my scar from my surgery. There were no stiches at all. It's been a long time since I posted anything at all here, even longer since I posted anything of substance. Let's see, what's happened. December 16th of last year, I went in for surgery to repair the posterior tibial tendon in my right ankle. the surgery went well, and I spent about two weeks in a cast, taking Vicodin. We just found the log I kept of when and how much I took. 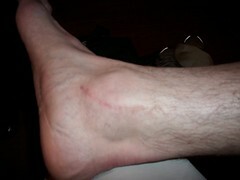 After I got out of the cast, I was in a boot, and on crutches for a few weeks. Of course, the winter was snowy and icy, and I spent January and February slipping and sliding around, fighting the snowbanks and icy sidewalks. I spent a few weeks in physical therapy, regaining strength and mobility in my ankle and foot. After that, the doctor gave me the OK to ride a bike. Since March, I've been taking the bus into work and riding home. About two weeks ago, I got the OK to start running again. I've been going about a mile at a time, once or twice a week. I still have to wear an ankle brace, but I won't be in that forever. The last race I ran was the 2007 July 4th race that starts and finishes in front of my house. I finished in 20:39 (6:40 pace), wearing an ankle brace, and with an undiagnosed tendon tear. Not too shabby, I was 53rd overall and 6th in my age group. I'm hoping htat next year I will be racing that race again.